The full technical documentation of all systems can be found on the RRZE documentation pages. To get access to any of your clusters you need an HPC account, which you can apply for using this form. As a prerequisite you need an IdM account, which you already have if you are a student or an employee at FAU. If you are not affiliated with FAU in any way, access to our systems can only be granted under special circumstances. Please contact HPC support in this case. with SSDs This cluster is for applications that require large amounts of memory. 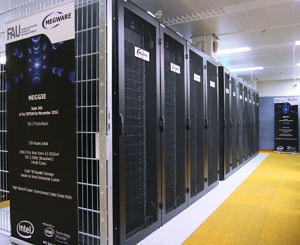 Each node has between 128 and 512 gigabytes of memory. Nodes 728 compute nodes, each with two Intel Xeon E5-2630v4 „Broadwell“ chips (10 cores per chip + SMT) running at 2.2 GHz with 25 MB Shared Cache per chip and 64 GB of RAM. Parallel file system Lustre-based parallel filesystem with a capacity of almost 1 PB and an aggregated parallel I/O bandwidth of > 9000 MB/s. Network Intel OmniPath interconnect with up to 100 GBit/s bandwith per link and direction. 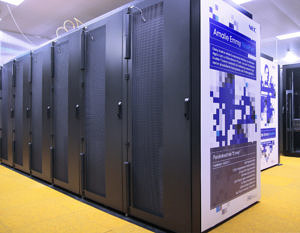 For the evaluation of microarchitectures and research purposes we also maintain a cluster of test machines. We try to always have at least one machine of every relevant architecture in HPC. Currently all recent Intel processor generations are available, including the many-core chips Intel Xeon Phi “Knights Landing.” Frequently we also get early access prototypes for benchmarking.